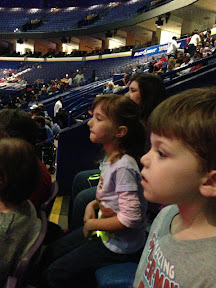 Last week we took the kids to Ringling Bros. Barnum Bailey Circus. Our friends Josh and Tammy invited us to go with their kids Gideon and Sylvie. At first I wasn't too excited to go. But with tickets at $12 a seat I relented. The seats were pretty good and the circus was entertaining. Luke spent most of the time in my lap with his hands over his ears. It was kind of loud and he's sensitive. Luckily he didn't freak out and burst into tears like he had done earlier this year at a baseball game.